I enjoyed your review. I enjoyed Miller’s Valley. I wonder sometimes, if writing suffers, when new books come out often. I do think that, but with some other authors…I don’t think Quindlen has been publishing super often? Well, I’m definitely glad I’m reading Every Last One first because at about the halfway make I’m loving that one. 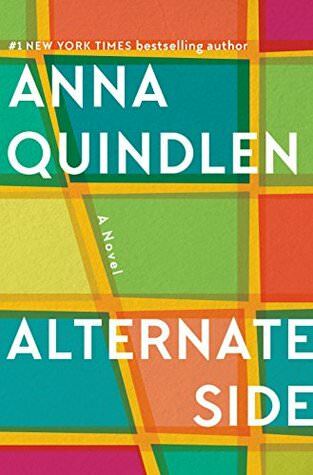 I’m still going to read Alternate Side (or possibly listen to it) and will probably review the two books together like I did with Claire Fuller’s last year. That would be perfect! And so glad you’re loving Every Last One! Aw, too bad. I do need plot and a focus as well as good writing. The snippets you shared were interesting, but it’s good to know going in that it is a quiet book about whatever. I would find it hard to top Every Last One. I loved that book. I need to reread it or maybe listen to it. I loved Every Last One, but I was also a little underwhelmed by Still Life with Breadcrumbs. I won’t rush out to read this one either, but man, she can nail it with the observations. If there’s more like the aberrational spouse quote that you shared up there, I might have to read it just for that. I don’t think I’ve ever read anything by Anna Quindlen. Sounds like this is not one to start with! Anna Quindlen is a really terrific author, and as the reviewer said, the rest of her work are all gems. She gets women. I have read everything she has written. This one just fell terribly short. Lots of Candle, Plenty of Cake will resonate with women of a certain age. She is so wise. I hope you fall in love. I agree and Lots of Candles is one of my all-time favorite memoirs! I’ll definitely give this a pass. The only Quindlen I’ve read is “Miller’s Valley” which was OK but didn’t send me searching for her other works. Read One True Thing and Lot’s of Candles Plenty of Cake and I bet you will be hooked. All of her other work is really good. Promise. I think I’m going to see if Ellen Archer can save this … I may bail! I DO love Quindlen’s nonfiction and essays. I used to read her Life in the Thirties column in the NYTimes waaaaaaay back when, and loved them. Haha – well, good! I try to write reviews so you can decide if something is for you or not regardless of how I felt about it…glad to know this one, at least, succeeded! I agree-ish about this one. Not in my top three of her books, but I think I liked it a bit more than you did. The marriage aspects. I did love the marriage quotes…she always nails those! I’ve been unsure about Quindlen’s fiction, though I think I might try One True Thing. I absolutely loved Lots of Candles, Plenty of Cake, though, so thank you for that recommendation! Oh yay!!! That’s definitely my favorite of hers…man does she nail the woman’s perspective! If you are interested in a nonfiction essay collection about life in New York, try one of her early books called Living Out Loud. It’s what made me an Anna Quindlen fan – a collection of her NY Times columns about living in New York while being in her 30s (she won a Pulitzer for the column). Ooooh – awesome! I just finished my current audiobook, so this could very well be my next one! I’ve been wanting to read some more of her nonfiction. I really enjoyed this book, as I have all of Anna Quindlen’s books. This one is definitely for one who gets the NYC attitude, etc. I grew up very near where Anna went to HS, and we’re roughly the same age. I’ve worked in NYC; it’s a unique place and difficult to explain. The people on her block / neighborhood are similar but show only certain “faces” in public. Especially telling is the owner of the “lot” who gives the Christmas parties every year! Who knew her secret. Good book.